Organizers claim that the administration wants to generate discourses around global issues that are financed by and subject to the annual approval of the Munk Foundation. Peter Munk is the chairman of the mining company Barrick Gold, a corporation facing frequent allegations of international human rights and environmental abuses. What’s more, Barrick is currently pursuing lawsuits against three academics who have written about these issues. Even the UofT administration seemed to expect controversy surrounding the acceptance of Munk’s money. Negotiations around the agreement were kept secret, even from the Governing Council – a body that is, at best, a façade of democracy. At the last GC meeting, when a student governor presented notice of a Munk-related motion, the chair tried to prevent her from speaking. Though the motion was served with due notice, the executive committee of GC arbitrarily voted to remove the item from the agenda of Thursday’s meeting, thereby stifling any debate on the topic. 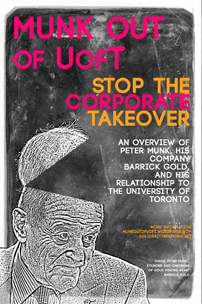 In addition to protesting the Munk contract, the rally targeted the privatization of the University of Toronto. At the meeting, the Governing Council is set to approve tuition increases that would ensure that for the first time ever, tuition and other fees would surpass public sources of funding in UofT’s projected budget. The message of the rally is clear: students, teachers, staff workers, and the public are not silent sources of profit; they are the university. And they will rally to enact a new vision for UofT that reflects the interest of their community, not corporations and not neo-liberal governments.